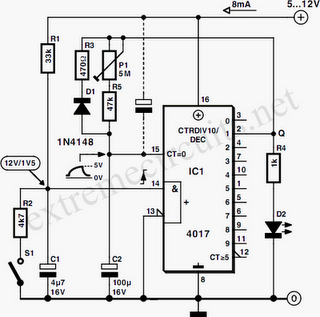 This circuit shows how a 4017 CMOS decade counter can be used to build a timer circuit. Push-button S1 will discharge capacitor C1 through resistor R2. When S1 is released, C1 will charge up through R1 causing a rising edge at the clock input of IC1. This causes the output Q1 to go high (to the supply voltage). Current will ﬂow through R4 and LED D2 will light. At the same time C2 will begin charging through preset P1 and R6. When the voltage on C2 reaches approximately half the supply voltage it will reset IC1. Q1 will go low, the LED will go off and C2 will discharge through D1 and R3. The circuit will now remain stable in this reset condition until S1 is pressed again. Preset P1 allows the ON time of the circuit to be adjusted between 5 seconds and 7 minutes. The current consumption of this circuit in its reset state is only a few micro-amps, rising to approximately 8mA mainly due to the LED current, when S1 is pressed. When power is applied to the circuit IC1, can be in an indeterminate state and the LED may be on. Pressing S1 until the LED goes off clears this condition. Alternatively C2 may be connected to the supply rail (as shown dotted in the diagram) this will ensure that IC1 will always power up in a reset state. A disadvantage of this conﬁguration is that any noise on the supply rail will be coupled through to the reset pin of IC1 and may affect the timing period.